Origin of the name “Algonquin”? Most traditional clothing was made of moose and deer hide. The most common clothing was the tunic, loincloth, leggings and moccasins. 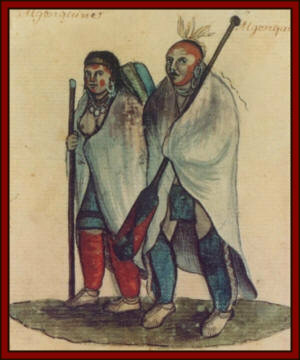 In winter, bearskins were widely used, especially for capes. For smaller garments such as hats and mittens, muskrat and beaver furs were chosen because of their impermeability. Clothing worn during ceremonies was often decorated with patterns made from porcupine quills, beads or shells. Some clothes were works of art whose designs were functional for several seasons. As for the large feathered headdress that American cinema has so often shown, this tradition is relatively recent (1800’s). It was the Crows that adopted the practice first, the tradition spread to many other nations. However, feathers always had a symbolic importance to all nations; especially those of an eagle who could fly highest and is believed to be closer to the Great Spirit. The eagle feather was given to emphasize a remarkable event. Only the Chief could wear a large headdress and it was only worn during important ceremonies. Algonquin headdresses were much simpler than the long headdresses made of hundreds of feathers demonstrated by cinema. Warriors clung to their hair a feather or two to demonstrate victory. 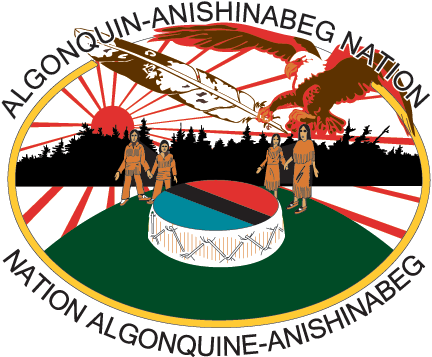 The Council has established two key priorities: the protection and advancement of the human rights of indigenous peoples, particularly those of the Algonquin Nation, and to provide support to member communities in human resources management, policy, communications and construction.